When can I get my child’s ears pierced? There really isn’t one correct medical answer to this question. I have heard pediatricians tell patients to wait until after their babies receive their first tetanus vaccine (at two months of age) but I have never heard of a case of tetanus from ear piercing, at least not in the United States. But, I wouldn’t take a younger-than-two-month-old to the mall where strangers could infect her with germs. And yes, the mall is where I send my patients for ear piercing. If I pierced 100 ears per day, than I would feel comfortable performing this procedure. If I pierce a set of ears once a month, I am hardly an expert. Just as I would refer your child to an Ear, Nose and Throat specialist for too many ear infections for further evaluation, I refer all ear piercing families to the mall where the experts use sterile technique many times daily and are in fact qualified experts. That said, some pediatricians do pierce ears and pride themselves on delivering the art, as well as the science, of medicine. If your pediatrician likes to perform ear piercing in the office, then consider it a convenience as well as a safe practice. Piercing hurts. 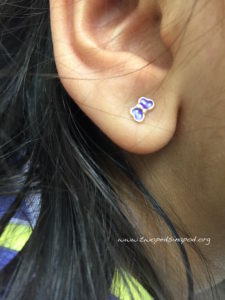 Take it from this pediatrician who was twenty-three (in medical school, after a really difficult neuroanatomy exam) when she had her ears pierced. It is fine to pre-medicate with ibuprofen (brand names Advil, Motrin) or acetaminophen (Tylenol). She will still feel the sting of piercing but the pain medicine may help prevent some of the throbbing which occurs afterwards. Some of the same techniques used to help ameliorate the sting of vaccines can also help ameliorate the sting of ear piercing. Keep in mind, after the pain of piercing with the first ear, your child may balk at piercing the second. Follow the instructions for ear cleaning. It takes around 6 weeks for the wounds to heal completely. Avoid dangling earrings. They can get caught on clothing or bedding and also are a choking hazard because babies/toddlers can more easily pull out the earrings and then put them into their mouths. At recess a hoop earring can snag as a child runs. Some kids are allergic to gold as well as nickel. If you notice the skin around the hole becoming red, itchy, or scaly, or swollen, your child is probably having an allergic reaction to metal. The only cure is to remove the earrings. Avoid piercing the cartilage of an ear. Infections occurring in the cartilage tend to be more serious than in the lobe of the ear. Warning: Pediatricians remove embedded earring backs on an all too frequent basis. 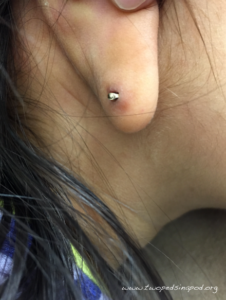 Even years after a piercing, the skin on the back of an ear may overgrow. This malady tends to occur in kids around eight years old or older when parents are no longer taking earrings out for their children. Check your child’s ears frequently to make sure the holes are clean and the earring parts are where they should be: in the hole in the ear, not embedded in an earlobe. Watch out, an earring can look fine from the front and you may even be able to twirl it around, but the earring back may be burying itself into the skin. Ear piercing for some families is cultural; for others, cosmetic. Piercing your child’s ears as a baby may lead to some interesting debates later about piercing other body parts. But that’s a topic for another post. 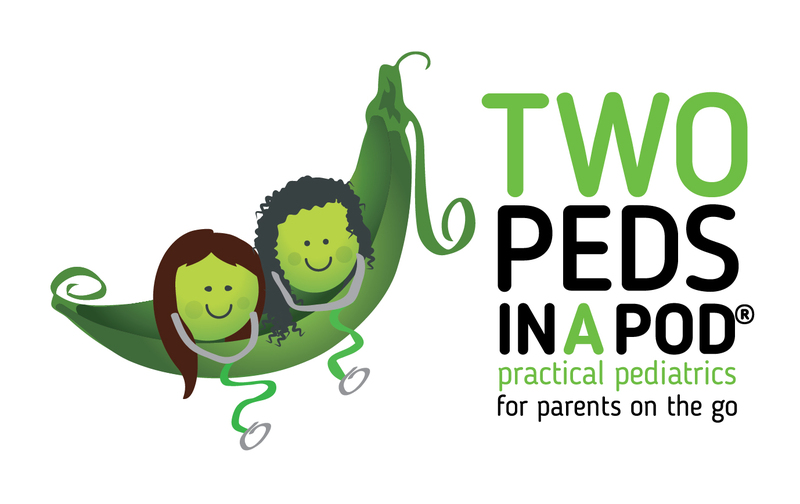 ©2018 Two Peds in a Pod®, updated from our prior post. Earring embedded in the back of an earlobe.